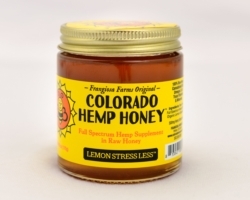 Enjoy pure and raw honey, full spectrum hemp extract with naturally occurring CBD and organic lemon essential oil in our 12 oz Lemon Stress Less. We have paired pure and raw honey with Colorado grown full spectrum hemp extract to create a superfood of the highest quality. * the addition of organic lemon essential oil creates a fresh, cool, slightly tart lemon essence that sharpens the mind. * These infusions create synergies that surpass the benefits of consuming each food individually.